Aija Meisters is a great painter, sculptor and graphic artist. Her work has been displayed in various Art galleries throughout Long Island, NY and other parts of the US. 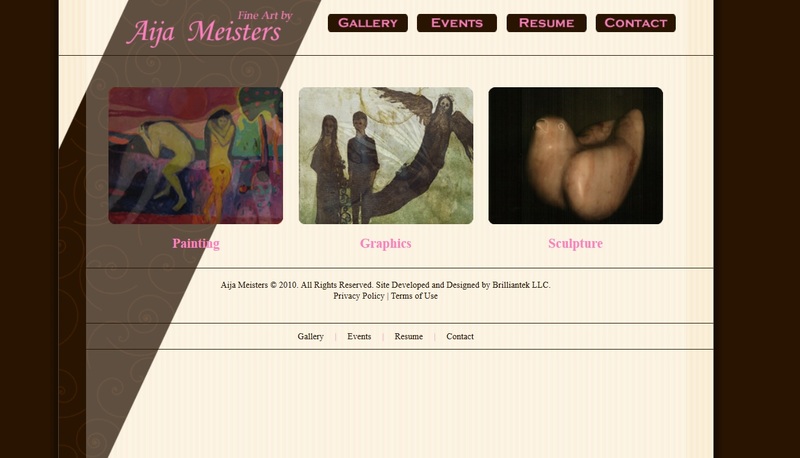 We provided Ms. Meisters a website that allows her to display her art work with ease. Her gallery of art work is displayed on the website in a simple and easy to use interface that followers of Aija express great complements because they feel they are right there with the art work. The level of detail and expression found on paintings and visible through the website is phenomenal. We designed the website in 2010 and provided Aija with the ability to upload her own paintings via a simple media manager created by us. The website utilizes a combination of website codes that make a users experience seamless. Recently, in 2014, Ms. Meisters switch her domain carrier to us and we are now hosting aijameisters.com. We are proud to say that we providing Aija with a one-stop shop solution for her. Aija wants to sell her painting, sculptures and graphic art and was thinking of implementing an e-commerce solution. We are in the works of providing her options and look forward to developing the shopping portion of her site.